This is what Tommy Berglund discovered when he strapped a GoPro to his dog, Klara. 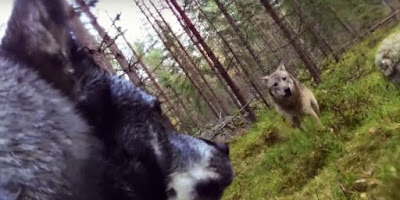 As any dog owner could tell you, most pups love to run around aimlessly the moment they get a taste of freedom, but Tommy never expected Klara to run into anything as scary as this: an angry wolf! One would think that a wolf, being as strong and aggressive as it can be, might intimidate Klara, or even attack her if provoked to do so. As the other wolves came toward her, things were not looking good for Klara at all. One of the wolves then began to circle Klara in an attempt to confuse her. What a scary experience! Klara was certainly a tough pup to stand up to a pack of wolves like that, and her owner must've been horrified when he watched the footage.